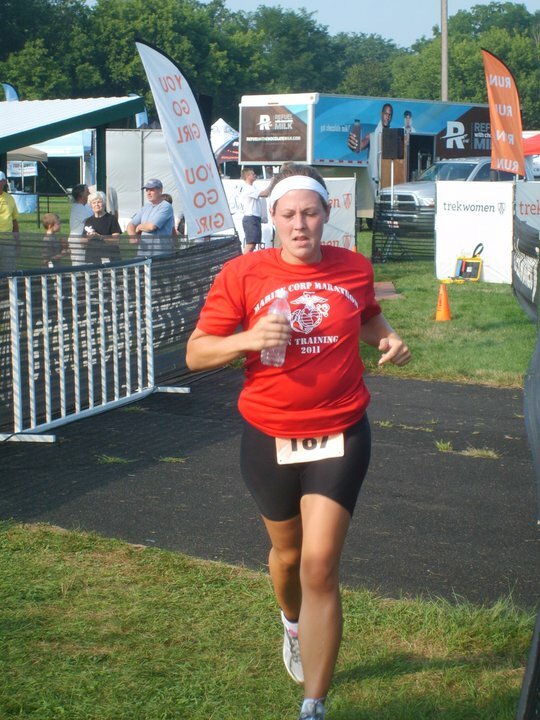 Race Date: August 7, 2011 @ 7:30 a.m.
After running for about a year, my Mom decided that running just wasn’t enough. 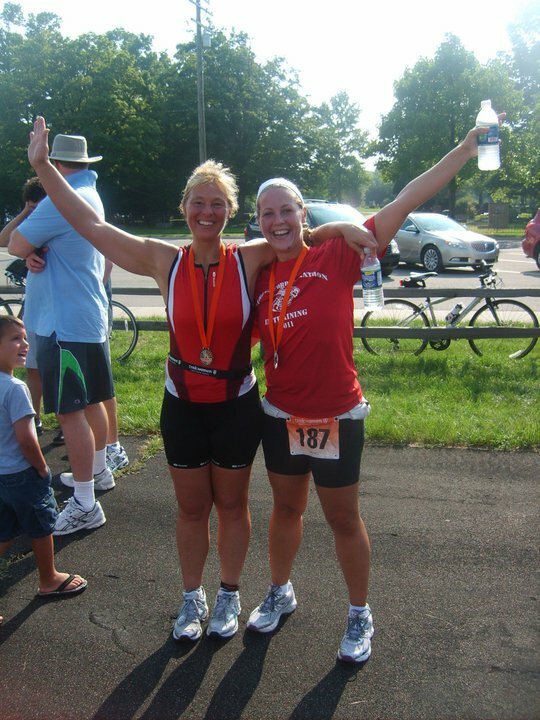 She believed it was time to tackle a triathlon and I agreed! The Trek Women Series Triathlon was coming to Howell, MI for the first time ever and this was the PERFECT triathlon to pick for our first one. The Trek Women Series Triathlon is a series of sprint distance (.5 mile Swim, 12 Mile Bike, 3.1 Mile Run) triathlons focused on getting women to participate in the sport. Their focus is on getting everyone to the finish line, regardless of your finish time. Mom and I begun training in January (of 2011) by swimming together once a week. 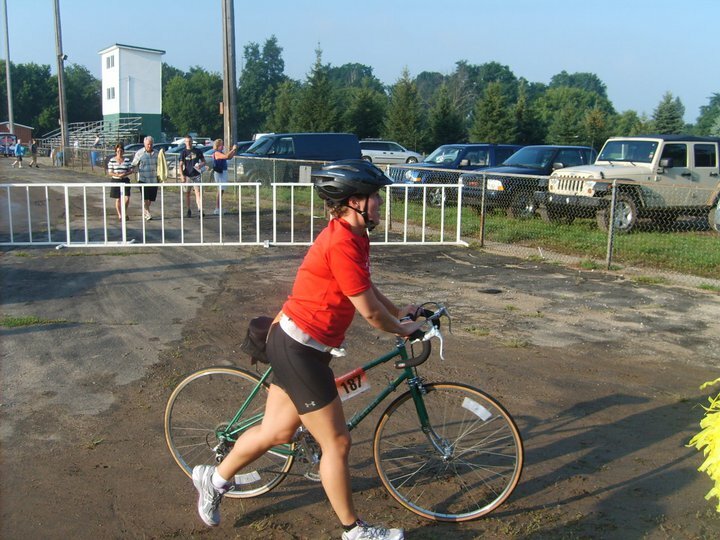 After having biked and ran for a year we knew that the biking and the running portions of the event would be “easy”. The day after Mom’s 45th birthday we woke up and it was race day! Our alarms went off at 5:30 a.m. and oh boy, was my body pumped! We had our breakfast, packed up our transition bags, and loaded our bikes! Around 6:00 a.m. we took off for downtown. Once there we had to walk our bikes about 1/2 mile to the transition area. 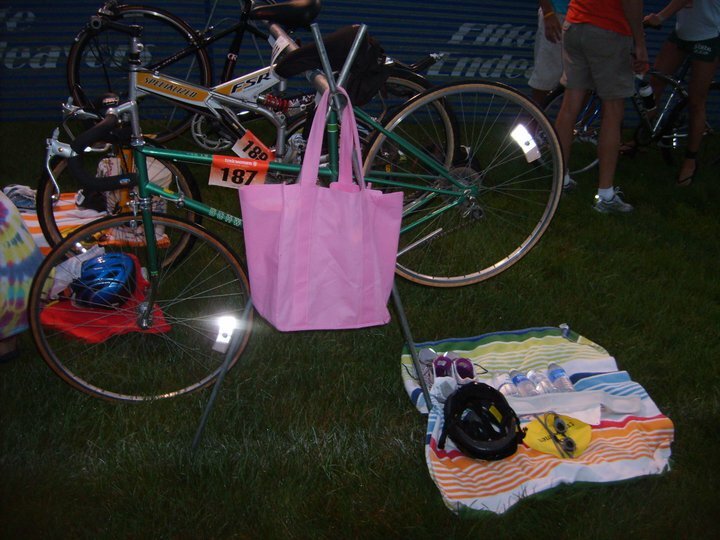 I took about 15 minutes making sure that my transition area was setup just how I had practiced it! There are so many rules to follow when competing in a triathlon and practicing your transitions is a key factor to having a great transition time! After making sure everything was setup just how I wanted it, it was time to head down to the water to wait for the event to start! Mom’s wave begun 8 minutes before mine did, and I was in the yellow wave (as indicated by the color of my swim cap). The swim portion of the event took me 26:42 to complete a 1/2 mile swim, and let me tell you what… I thought I was going to die! Like I had planned, the swim was by far the hardest of the three events to complete! After finishing the swim, it was time to head off on the 12 mile bike! This is where I knew I would excel! I finished the 12 mile bike ride in 45:13. A little slower than I would have liked; however, being my first triathlon I wanted to make sure I had enough “legs” left at the end to complete the run. After the bike, it was time to head off into the cemetery for the last leg of the race, the 3.1 mile run! I finished the 5k with a time of 39:00. Although I had a lot of “legs” left for the run event, around the 2 mile mark I had a mental burn out and walked for about 3/4 of a mile really dragging my time down. Dragging myself to the finish line, I crossed as proud as I’ve ever been on myself in my entire life! 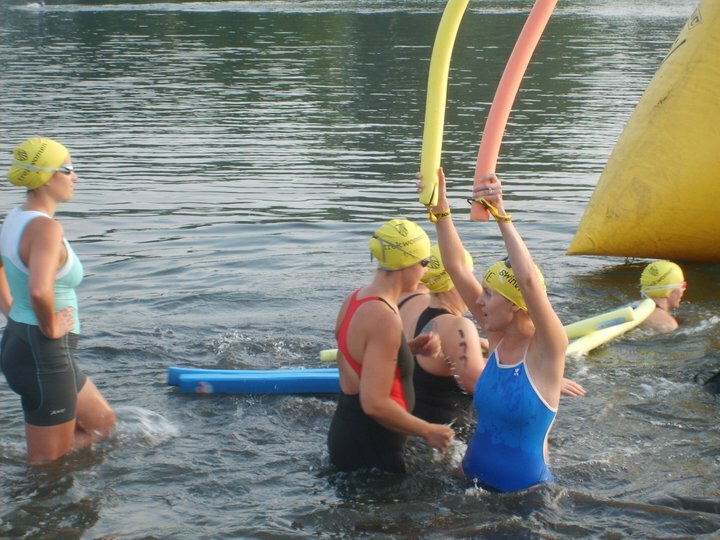 I can’t wait for 2012 and the next Trek Women Series Triathlon event! This is an event Mom and I will compete in every year. In fact, I’ve added it to my bucket list to one day complete ONE Ironman Distance Triathlon event!